Developer Quote: "Arrows is an irresistibly challenging, yet simple puzzle game. It’s easy to play, but difficult to master!" With an abundance of games on the App Store, it is getting increasingly more difficult to decide which apps I will keep on my limited 16 GB iOS devices. No I have not sprung for what should be glaringly obvious to me - 32 GB of space - instead, having to agonize over what I term "keepers and losers". 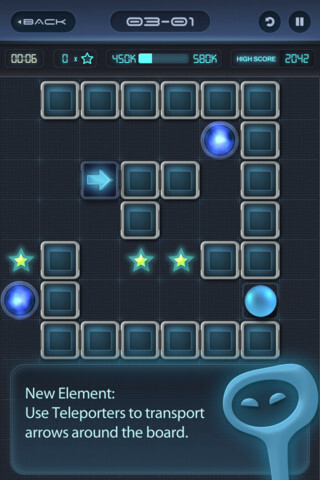 From the futuristic, neon blue launch screen of Arrows Puzzle Game to your last score, you will be pleased with this polished puzzler unlike any other. You are given instructions as you begin the game on how to play. This I really appreciate so that it is never necessary to leave the home screen to find a tutorial. Basically, you want to swipe a colored arrow to reach a like-colored orb. Doing so will eliminate all tiles in the way. Your obstacles are the blocks that fit in the path of the arrow. 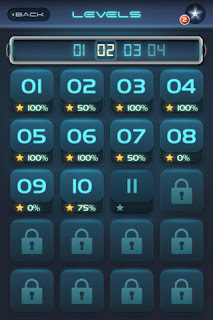 After each level, you will see your Score, High Score, Stars % and other statistics. Feel free to jump to the next level, retry the previous one, or see which level you are currently playing. You can purchase a Solutions pack (which will come in pretty handy!) if you get stuck. When you collect the stars you get higher scores, as well as unlock Bonus Levels. Remember there is always more than one way to collect stars, so think about it and move your arrows strategically. And the key here is - never look back! Because your arrows cannot go backward! Share your scores on Facebook or Twitter and see what your friends are doing on the Game Center. 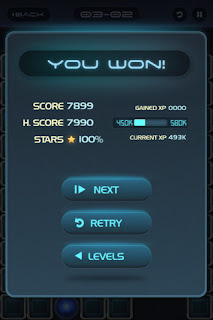 Loads of achievements are unlockable not that you need incentive to play this glossy game with an outer space theme! 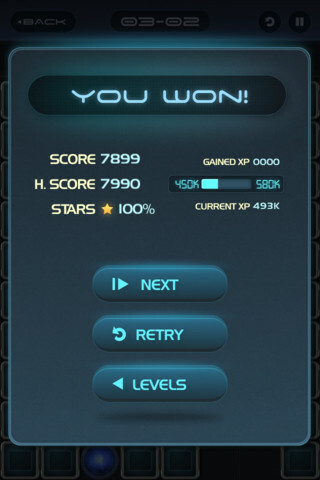 The visual appeal of this universal iPhone, Pad futuristic puzzler app is completely evident on iPad. Here you can catch the gleam and sparkle of the orbs and arrows as they race by. Enjoy all of this while listening to a relaxing soundtrack. There are powerups to help you along the way, and a new cunning twist to each level so that you are never allowed to rest on your laurels or grow bored! 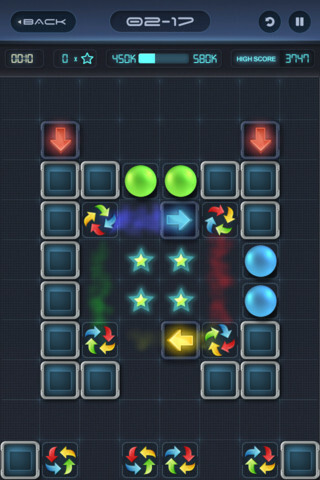 Watch how quickly time slips away when you play Arrows Puzzle Game. COOL CONCLUSION: Expect a sleek and modern travel through space as you fill your brilliantly colored orbs with arrows in the challenging, beautifully presented Arrows Puzzle Game. --Related Links: Fluke HD (another top notch Local Aliens game) is also available on the App Store.